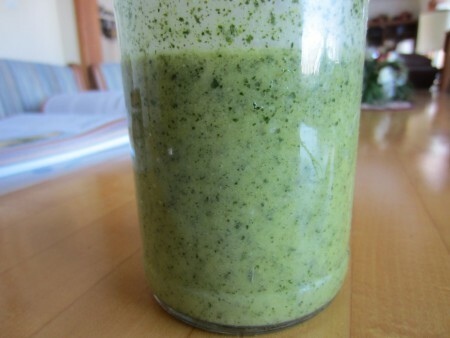 I have this homemade dressing in the fridge most of the time; using it when making many different green & even other vegetable salads. We are trying to use less store bought dressings that contain less nutritious ingredients such as the fats so as much as I can, homemade it is! This recipe uses extra virgin olive oil which is a very healthy and beneficial fat. In our home this recipe will be enough for a few weeks, but when I make a salad for 40 or so people, I use almost the whole recipe. When mixing these salads, I will just add as much of this dressing as I need. I try to add as many different nutritious herbs as possible to all salads, so that is why I decided to add the parsley and leeks to this dressing recipe; making it simpler to mix a salad in a hurry. The amount of honey I use will determine how sweet it is, so you can adjust the recipe according to your preference. As well, at times I may want a different flavored salad so I will mix a portion of this dressing with salsa, mayonnaise, sour cream or kefir. I even use some of it in vegetable dips. I often have 2 of these recipes in the fridge; one with the amount of honey listed below and one with half as much or even a bit less. There are times when we do not want a sweet dressing so I then have a choice. 1 1/2 tablespoons parsley flakes (optional) I grow, dry and freeze enough for the whole year. 1 1/2 tablespoon dried powdered leeks (or onion flakes) (optional) I grow, dry and freeze enough leeks for the whole year. Put lemon juice, mustard and melted honey into a small glass bowl. Mince the garlic, let it stand for about 15 minutes for maximum nutrition, then add it, plus the salt and pepper and water to the bowl. Heat a bit in the micro-wave. Add the olive oil and puree until well mixed. Add and puree in the dried parsley and leeks. Pour into a jar, cover and store in the fridge. Use in recipes as mentioned above or your own recipe! Shake before using. Have a Blessed and Healthy New Year!